For years, the projects’ owners kept adding new rides and features to the planned project while simultaneously pushing the projected opening date forward. The last date announced was a 2019 debut. Now, the Website that featured the project, known as Skyplex, has been removed (all but dashing hopes that it will ever get built). But in the never-say-never department, the following is information about what was on the drawing boards for the ambitious ride, dining, and retail district. Maybe someday something like it will get resurrected in Orlando or elsewhere. The featured attraction at Skyplex was supposed to have been the Skyscraper roller coaster. It would have been the tallest roller coaster in the world according to the project's developers. But Skyplex would have included other crazy-tall rides as well as other things to do, to eat, and to buy. 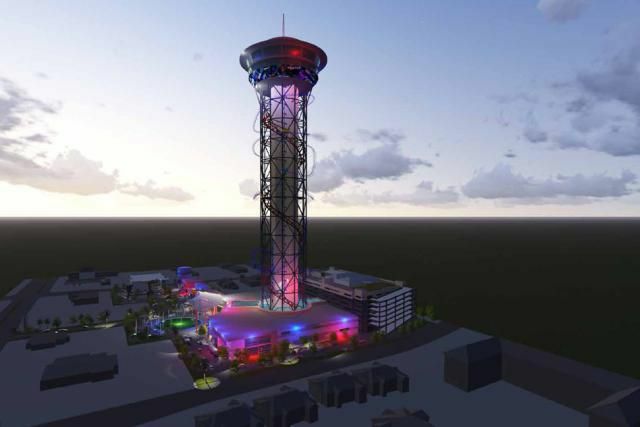 Skyplex would have been located on the city's main tourist corridor and would have been one of the key players among the many cool things to do along Orlando's International Drive. Let's run down the features that were announced. The highly unique ride would have snaked up a tower. Unlike most coasters it wouldn't have included a first drop to ground level, but would have incorporated a series of inversions, drops, and other elements as the single-car trains made their way down the tower. If you are the least bit afraid of heights, turning upside down some 550 feet in the air could have been a deal breaker (or might have sent you into a raging fit of crippling anxiety). In addition to the coaster, daredevils would have been able to race down the side of the Skyscraper tower by boarding the SkyFall drop ride. At an announced height of 450 feet, it would have been the tallest thrill ride of its kind in the world. Drop rides are simple in concept: Passengers slowly ascend a tower, stew for a few nerve-wracking moments at the top, and then free fall down at a breathtaking speed until magnetic brakes kick in. Pictured is Zumanjaro: Drop of Doom at Six Flags Great Adventure, the current record-holder for drop rides. Details from the Skyplex folks were a bit sketchy on this (and other planned features for the complex), but they were calling this a "600-foot zipline attraction." Ziplines generally send passengers racing more or less horizontally in the air. We'd imagine that SkyFall would have been more like a "controlled free fall" such as the SkyJump at the Stratosphere Tower in Las Vegas. If we are correct, passengers would have donned a body harness at the 600-foot level of the Skyscraper tower and jumped off. Cables would have controlled the speed of descent. Obviously not for the faint of heart (even more than the SkyFall drop ride and the Skyscraper coaster in our estimation), SkyFly would have been one heck of a rush. The 870-foot Las Vegas SkyJump would have been taller than its Orlando counterpart. But SkyFly would have been the tallest ride in Florida. If the three crazy-tall rides got you all sweaty and anxious, you could have chilled out in the pools that would have been located on top of the 10-story parking garage at Skyplex. Among the attractions in the mini water park would have been a surfing ride. While details were not been released, it's likely that it would have been some kind of FlowRider surfing attraction, such as the one pictured here from Schlitterbahn in New Braunfels, Texas. Riders on boogie boards would have been able to ride a continuous wave. Complete wimps could have avoided the thrill rides altogether, but still could have enjoyed striking views by taking glass elevators to the observation deck atop the tower. Details were not revealed, but it's likely that the deck would have included dining and retail options as well as a bar. At ground level, plans called for SkyPlaza, an open-air mall that would have included dining, shopping, and entertainment options. A planned 10,000-square-foot Perkins Restaurant and Bakery—the world's largest—was announced. SkyPlaza would have been connected to the Skyscraper tower via a pedestrian bridge. Passengers would have boarded the coaster indoors at the base of the tower. In addition to the ride, the base of the tower would have included arcade games, simulator rides, and other attractions. Developers said that a 350-room hotel was also on its way to the complex.